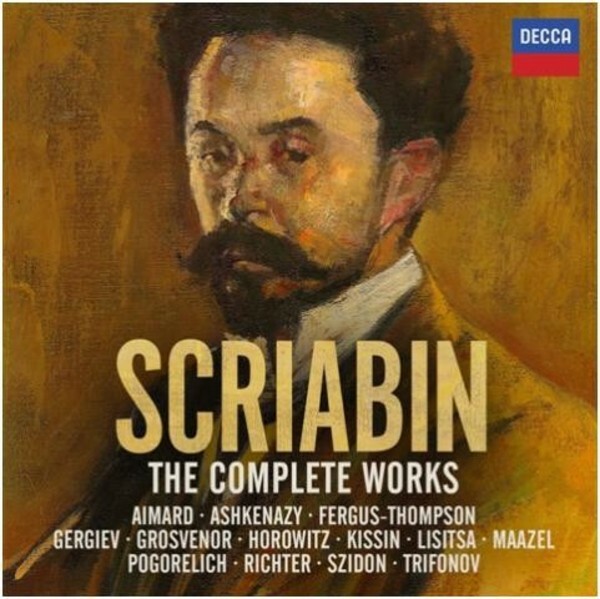 Marking 100 years since his death, this is the first ever set of the complete works of Alexander Scriabin. Drawn principally from Decca�s distinguished catalogue, the set also features no fewer than 64 newly-recorded tracks - over 200 minutes of music, newly recorded by Vladimir Ashkenazy and Valentina Lisitsa especially for this set. Scriabin has in recent years become admired as one of the early 20th century�s most innovative and influential composers. The set concludes with a bonus disc showcasing great pianists across Decca, Philips and DG who have played Scriabin down the years, from Horowitz, Richter and Cherkassky onto Kissin, Grosvenor and Trifonov. Scriabin was a Russian composer and pianist who initially developed a highly lyrical and idiosyncratic tonal language inspired by the music of Fr�d�ric Chopin. Quite independent of the innovations of Arnold Schoenberg, Scriabin developed, via mysticism, an increasingly atonal musical language that presaged twelve-tone composition and other serial music. He may be considered to be the primary figure among the Russian Symbolist composers. Scriabin influenced composers like Sergei Prokofiev, Nikolai Roslavets and Igor Stravinsky, although Scriabin was reported to have disliked the music of both Prokofiev and Stravinsky. - Symphony No.3 in C minor, - "Le Po�me Divin"